Regardless of the record, the best indication of a team’s success is often how far it[more] came from the start of the season to the end. 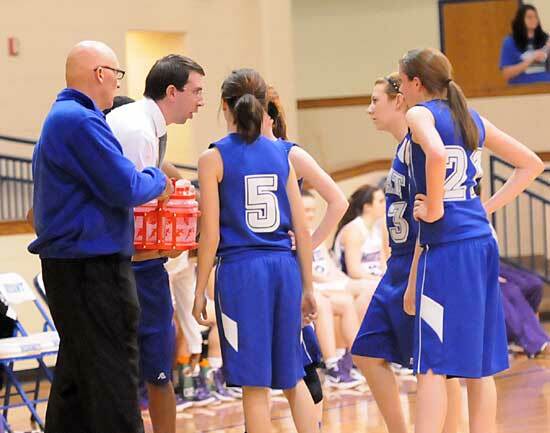 And that’s why, when the Bryant Lady Hornets freshman team’s season came to a conclusion with a 33-28 loss to the Mount St. Mary Academy Mounties on Thursday night in the first round of the Central Arkansas Junior High Conference tournament, head coach Nathan Castaldi had nothing but good things to say about his team. Though they finished 1-21, the Lady Hornets went out in a fashion indicative of their season. They fought until the end. They found themselves trailing 29-14 early in the fourth quarter after the Mounties came out with high energy after the half and put together an 18-point quarter after they’d managed just 9 points in the first half. 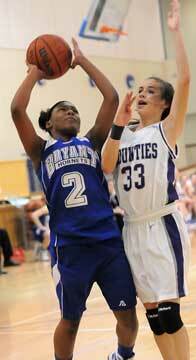 The initial third-quarter burst was a 10-1 run interrupted only by a free throw by Bryant’s Destiny Huffman. But after Mount’s Star Deuschle converted a pair of free throws to make it a 15-point lead in the first few seconds of the fourth period, the Lady Hornets started whittling. The Mounties didn’t score again until just 1:27 was left in the game and, after scoring seven field goals in the third quarter, they didn’t have any in the fourth. Huffman knocked down a pair of free throws to start the rally. Another by Jayla Anderson and two more for Huffman had the lead down to 10 at 29-19. After a Mounties miss, Bryant’s Taylor Lindberg, who led all scorers with 10 points to go with a game-high nine rebounds, buried a 3. Following a Mounties turnover, Anderson added a driving layup. Another turnover led to a foul that sent Nikki Clay to the line. She converted once and it was a 4-point game. With 2:01 left, Payton Koller had a chance to stop Mount’s drought at the line but missed the front end of the one-and-one. With 1:49 left, a free throw by Lindberg had Bryant within 29-26. And when Anderson made a steal, they had a chance to get closer. But, in her haste to get past a defender on her way to the basket, Anderson lost the ball out of bounds. Moments later, Koller was fouled again. 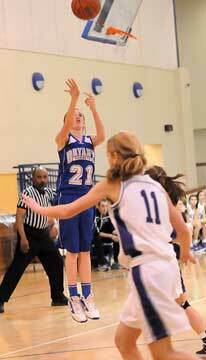 This time, she made both shots and the Lady Hornets were never able to get that close again. Sloan had also hurt her hand but she came back late in the game to help the Mounties hang on. Allison Riccardionne hit a free throw with :54.6 left and Sloan converted one with :16.1 to go, setting the final margin. It was the third time this season the two teams had met and in both previous contests, Mount won by 2, once in overtime. And it looked like it would be that kind of game early. The Mounties had a 6-2 before a free throw by Lindberg in the final minute of the first quarter made it a 3-point game. Lindberg added another charity toss to start the second period and when Kierra Solinger hit a baseline jumper, the Lady Hornets had pulled even. Cynthia Weyrens put the Mounties back on top with a 12-foot jumper then Koller, who led her team with 9 points, hit a free throw. With 1:17 to go, Lindberg scored inside and Bryant trailed just 9-8. Anderson and Clay combined to force a turnover but, after a Bryant timeout, Mount St. Mary forced a Bryant miscue then Sloan missed a shot at the buzzer to leave it a one-point game at the half. 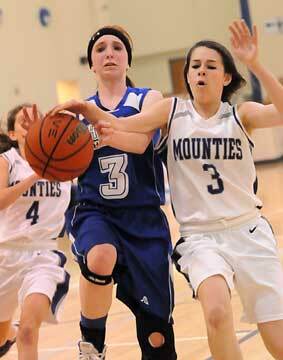 Koller then had 6 points in the Mounties’ third-quarter surge. Huffman and Anderson kept Bryant within hailing distance but Deuschle and Allison Alewelt each scored late in the quarter to bump the margin to 27-14 going into the final six minutes. Anderson 2-2 2-5 6, Clay 0-2 1-2 1, Davidson 0-1 0-2 0, Curry 0-3 0-0 0, Lindberg 3-7 3-6 10, Huffman 1-6 7-8 9, Solinger 1-4 0-0 2, Powers 0-0 0-0 0. Totals 7-25 13-23 28. Sloan 0-6 1-2 1, Alewelt 3-5 0-2 6, Weyrens 2-3 0-0 4, Koller 2-8 5-8 9, Payne 2-3 2-2 6, Riccardionne 0-1 1-2 1, Catlett 0-2 0-0 0, Deuschle 2-3 2-2 6, Shaw 0-0 0-0 0. Total 11-32 11-18 33. Three-point field goals: Bryant 1-3 (Lindberg 1-1, Solinger 0-1, Clay 0-1), Mount St. Mary 0-3 (Koller 0-2, Sloan 0-1). Rebounds: Bryant 32 (Lindberg 9, Davidson 6), Mount St. Mary 16 (Koller 5). Turnovers: Bryant 22, Mount St. Mary 11. Team fouls: Bryant 15, Mount St. Mary 17. Fouled out: Mount St. Mary, Payne.